Whenever you ask a YouTuber how much money do they make, more often than not they replied with – ‘It depends on a number of factors such as the type of video, audience age, demographics etc’. While this is true, it doesn’t answer the question. So, here I’m. In this article, I’m not only going to tell you how much do popular YouTubers make but also how you can calculate revenue of pretty much any YouTubers. Before we begin, let’s make one thing clear. The purpose of this article is not to find how much money other YouTuber are making. Honestly, that should not be any of your concern. 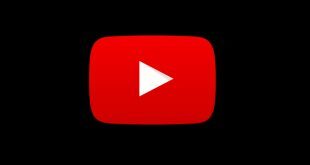 Rather, if you are looking to start your own YouTube channel and wants to get an estimate of how much potential revenue you can make down the line, this article is for you. Now, with that out of the way, let me tell you why I’m the right person to cover this topic. Not to brag, but I have been YouTube partners for the past 7 years and since then I’ve uploaded more than two hundred videos which get over one million views every month. Also when you run a YouTube channel for so long, you not only open few other small channels but also meet up with other YouTubers. So, I believe, I’ve decent information on making money on YouTube. That said, if you are expecting answers to question like – how much money do you make per 1000 views on YouTube, then this article is not for you. There is no way, anyone can tell you the exact numbers. The CPM (in simple words revenue per 1000 views) can vary for $0.25 to $4 depending on many factors like – audience’s age, country, type of video, the price of specific ads, Adblock, etc. In short, there are many factors to consider, for example, this YouTuber claims to make only $398 from 1 million views. The reason being, most of his video was less than 2 mins long – too short for advertisers to play their ads. The point being, after reading this article, you’ll have a pretty good idea of how much does YouTubers make, but there is no way to be 100% sure. Also, for starters, how much does YouTube pay and how much money do YouTubers make are entirely two different questions. For big YouTubers, earning for the YouTube ads is just one part of their income they generate from YouTube. So, before we drive any further, let’s understand this part first. How YouTubers Earn Money on YouTube? Wherever there is attention, there are advertisers. In my opinion, YouTube is not the biggest money-making platform. At least when considering the resource YouTubers put into making videos, the reward isn’t proportional. Which is why most medium to big size YouTubers have several ways of generating money. We have an in-depth article on how do YouTube channels make money, but in a nutshell, there are two major sources. 1. 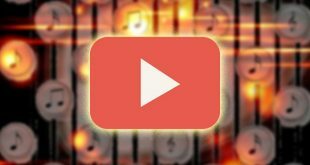 YouTube Partners program: This one is the most popular way of making money on YouTube. You may have noticed a 5-10 sec ad at the beginning of many YouTube videos. Well, that’s the YouTube ads. Almost everybody can get approved for this, all you have to do is upload original, quality content and if your channel is eligible. Google shows ads on your videos and you receive a percentage of revenue from advertisement. The split is 55-45. So if an advertiser pays 100$ for ads on your video, Google takes $45 for providing you hosting and other stuff while you get 55$. Fair enough! 2. Secondary Means: Once the channel becomes big, brands approach the content creators to promote their product. This can be done in the form of brand partnerships, product placement, selling a clothing line. There are other means as well like Patreon, Amazon Affiliates or even selling your own merchandise, etc. But this mostly happens with big YouTubers with a big audience. 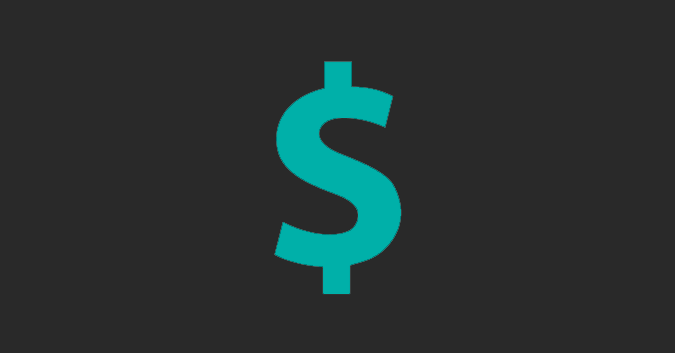 The industry usually pay is around $100 – $10,000 per sponsored video. You can find more information on FameBit. Let’s start by analyzing the income report of popular YouTubers, who were gracious enough to make it public. Scandal and T-Series haven’t stopped Pewdiepie (real name Felix Kjellberg) from becoming the #1 YouTuber in the World. And although he has never share income reports publicly, after Wall Street Journal article he confirmed to an audience on Reddit that he had earned “roughly” $4m in 2013 and according to Forbes, he made $15.5 million last year in 2018. Although it’s worth pointing out, not all of the money goes to Felix’s bank, a good chunk of it goes to paying tax, managerial and production fees, which is the case with any other YouTubers or businesses. Pewdiepie may be biggest YouTubers when it comes subscriber counts, but guess what, a 7-year-old boy made the most money in 2018 by unboxing toys and building Legos. According to Forbes, his channel made $22 million in pretax income from June 1, 2017, through June 1, 2018. Since Ryan’s channel makes most of its revenue for YouTube ads, I did some rough calculation using SocialBlade, turns out, Ryan’s channel gets around 25M views every day or 9125 million views in a year. Which means he gets roughly around $1.97 for every thousand views i.e. he’s CPM is 1.97. Let’s talk about smaller YouTubers now. Okga runs a personal channel revolving around beauty tips. Like Pewdiepie, she has also not revealed her income publicly, but in an interview with NYTimes, says she earned some $100,000 to $130,000 in the past three years. Using social blade, I did some calculation and found out, she gets around $5 for every thousand views. She also mentioned, the revenue was quite less to cover basic expenses of production. Olga hasn’t published many videos from the past year. It’s another medium-size YouTube channel that upload once in the month, mostly random topic related to other YouTuber and Twitch. 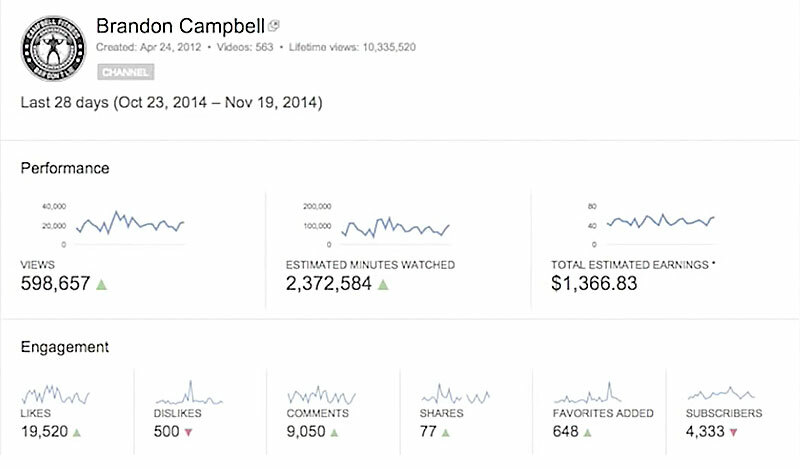 The income report he shared in this video came out to be $26,000 for some 18 million views. Simple maths say it’s around $1.5 for every 1000 views. After a year, he again revealed his income report for one video which shows he made $6200 for 2.4 million views, i.e. $2.58 for every 1000 views. Brandon runs a YouTube channel that focuses on fitness and bodybuilding, and in this video, he released his monthly earning which is around $1300 every month from 600k views. This roughly means $2 for every 1000 views. These numbers stayed consistent after one year. Nick make videos related to bodybuilding. And the income report he shared in this video a year ago, shows he made $3000 for 4 million videos, i.e. around $.8 for every 1000 views. The video was made back in 2015, the channel has grown a lot in a few years. It would be unfair if I talk about everyone’s earning and don’t show you mine. Now, although I’m not comfortable to reveal my main channel earning, I can share the earning reports of another small channel that I’ve created a few years ago. On this channel, I review the gadgets I owned for more than 3 months. But since it never took off, I quit uploading videos on it. So, this should give you an idea of passive earning on YouTube, once you leave your channel for a few years. 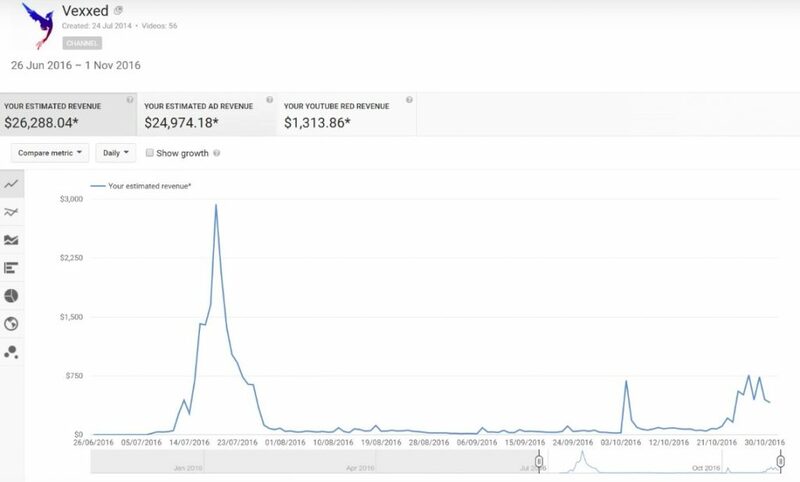 Last year, from Jan 2018 to Dec 2018, I got 33,000 views and made $2. 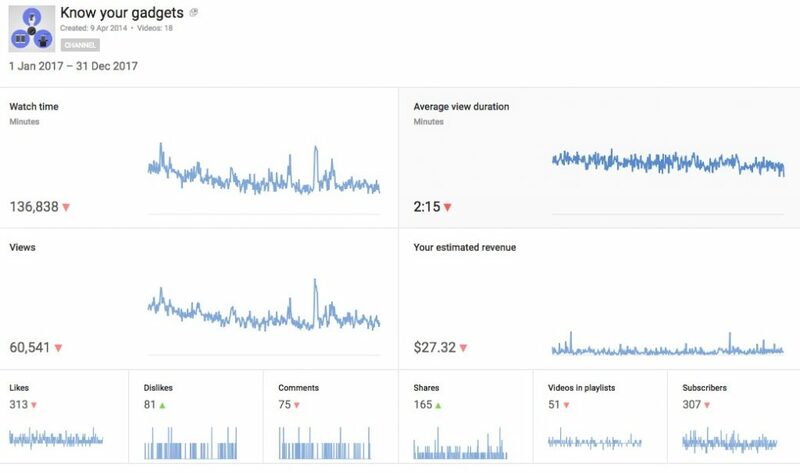 While the previous year, I made $27 from 60,000 views. That’s an average of $0.45 per 1000 videos. So what’s does it mean? Well, we learn two things from it. One, Pewdipie makes a fortune out of YouTube. And second, average YouTubers make 1-5$ per 1000 views. If you are a big YouTuber who gets millions of views per month from the US and UK, then your earning can go up to $5 per 1000 views. However, this is the best case scenario. From my experience, most YouTubers get $1-2 per 1000 views. And if most of your audience are from developing country like India and Bangladesh (and that too from tier 2 or tier 3 cities) then you can get as low as $.5 for 1000 views. 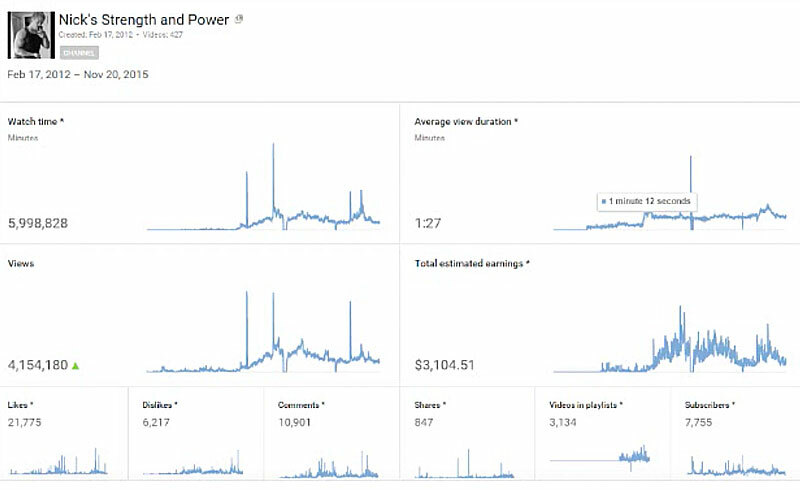 I recently came across a YouTuber who make videos in region language (Hindi), his monthly earning was $150 for 300,000 views. He quit YouTube as full-time once he graduated. Since there are many factors involved in how much money can you make from YouTube, it’s pretty hard to calculate their exact earnings. First, find out that the channel’s monthly views using the Social blade. Let’s say it’s 500,000 views per month. Now, remove the last 3 digits of view (i.e. 500,000) and multiply the remaining number from $1-2 depending on the quality of the audience. Usually, the number is $1.6. So, their final earning would be between $500 – $1000. In most cases, it’ll be around $700. But then again, if the majority of the audience is from a developing country (like India), the revenue can go as low as $250. Recently, Socialblade also built a YouTube earnings calculator, which unfortunately is not much accurate. When I entered my channel name and monthly views, it shows the daily earning between $6 to $100. That’s a very big range. Therefore, I suggest you analyze the traffic yourself and use the above calculation. That will give you much better results. In a nutshell, making money on YouTube is not that easy. The production cost that includes — camera, editing, lighting, studio, etc are pretty high and the returns are not so good, at least in the beginning. But if you can gain some traction and become big, then there is a possibility to do this as a full-time job, because then you’ll have many other ways to monetize your videos. If I can do it, you can do it too. Just don’t expect huge returns in the beginning.